"At this stage in my life, I only talk to who I want to talk to, okay?" It's a right that Oprah Winfrey has more than earned. But thank goodness that the media mogul determined Prince Harry was someone that was going "to stimulate, inspire and lift" her up, the criteria she gave during an appearance on The Daily Show Wednesday to explain the type of people she chooses to surround herself with. Because when the queen of all media pairs up with Britain's most charming prince, good things are bound to happen. "We are excited to announce that The Duke of Sussex and Oprah Winfrey are partners, co-creators and executive producers on their forthcoming mental health series launching on Apple in 2020," the official announcement, posted to Harry and wife Meghan Markle's new Instagram account Wednesday, declared. "The pair have been developing the series for several months and are looking forward to sharing such an important project on this global platform. Already well underway, the multi-part show "will focus on both mental illness and mental wellness," the release continued, "inspiring viewers to have an honest conversation about the challenges each of us faces, and how to equip ourselves with the tools to not simply survive, but to thrive." It's a venture we never saw coming, but now that it's been revealed you almost wonder what took so long. Two astonishingly influential people teaming up for a cause close to their hearts that seems to grow in importance almost by the day. Of course these two would try to change the world. "I can safely say that losing my mum at the age of 12, and therefore shutting down all of my emotions for the last 20 years, has had a quite serious effect on not only my personal life but my work as well," he told the Telegraph's Bryony Gordon for her Mad World podcast in April 2017. Sure, he managed to do quite a bit of good with his enormous platform, serving two tours in Afghanistan and dedicating his life to helping his fellow veterans and those afflicted by AIDS. But with so much attention trained on his personal life as everyone wondered when the cheeky ginger prince would settle down, and the unchecked emotions roiling inside him, "I have probably been very close to a complete breakdown on numerous occasions," he told Gordon, "when all sorts of grief and sort of lies and misconceptions and everything are coming to you from every angle." "After how many years of listening to stories from veterans and their families and then specifically in this campaign, William, Catherine and I hearing some of the most heart-wrenching stories based around what people have experienced and then the mental anguish that's happened from then, it was only right to share my experiences to hope to encourage others to come forward and smash that stigma, to make it easier for them to talk about their own experiences," he explained of his motivation weeks later while appearing at the London Marathon Expo. "So I was just doing my bit." In other words, as Winfrey put it while chatting with The Daily Show's Trevor Noah, "Harry and I are going to normalize it to the point that people will be like, 'Hey, I've got mental illness!' That's what you want, to call it out to the point where it's no longer such a stigmatized big deal, it's no longer a taboo." "These girls come from provinces all over South Africa. When you're dealing with people who come from lots of trauma, that trauma shows itself in later life as depression sometimes, as anxiety sometimes, as mental health issues," she explained. "And there was a time where I had five girls in the hospital at the same time, with depression, suicidal ideation, all kinds of things. So I became interested in the subject of mental health because I spent too many times in a psych ward and because I recognized that the impact of poverty and the impact of trauma in poverty really causes people to carry that into their lives unless it is processed, and unless they can come forward in a way that releases it." 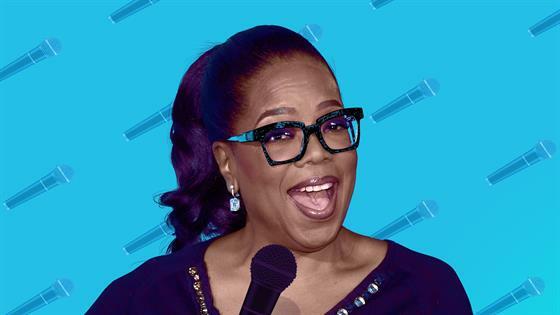 Though she'd certainly been aware of the pervasive problem before, even dedicating hours of her flagship talk show to the issue, "I didn't fully understand it," she noted in the February 2016 issue of O, The Oprah Magazine. "As is the case with a lot of people, it wasn't real to me until it was in my own family, until I was in the position of trying to help loved ones take better care of themselves and stay on their prescribed medication (a real problem, since many people who start to feel better want to go off them)." Dealing with such issues hands-on helped her to realize how much people wrangle with the idea that psychological issues are no different than any other malady. "So many people live in shame, hiding their struggles, not seeking help. We, as a culture, have not fully acknowledged how much help is needed," she wrote. "We need to start talking, and we need to start now." "I was having a conversation with him. I actually asked him, 'What do you think are the most important issues facing the world right now?'" she relayed during a Wednesday appearance on CBS This Morning. She'd been booked on good pal Gayle King's show to discuss her latest tome, The Path Made Clear: Discovering Your Life's Direction and Purpose, but chatter naturally turned to her just-announced princely partnership. Harry's answer was hardly surprising, she continued. "He said, 'There are two: climate change and mental wellness, mental fitness.' As you know, he's spoken about his own issues and what he went through after his mother died and how being able to talk about it has benefitted him so. And so it's a passion of his." But his response gave her an idea. "At the end of the conversation I said, 'I'm going to be doing this thing with Apple. It's a big concern of mine too. I want to try to erase the stigma,'" she recalled. "And he said at the end of the conversation, 'If there's anything I can do to help.' And I go, 'As a matter of fact…'"
She didn't become a billionaire media mogul by being timid, after all. And why wouldn't Harry jump at the chance to team up with someone so influential? The former apache helicopter pilot has shown he understands the unique power of celebrity, joining up with Rihanna to get tested for HIV on World Aids Day and watching as William participated in a video chat with Lady Gaga about her struggles with PTSD for their #oktosay film series. As for how Harry and Winfrey were even conversing in the first place, well, that road likely leads back to his mother-in-law Doria Ragland. Ahead of daughter Meghan's landmark vows to Harry last May, the devoted yogi and social worker accepted an invitation to join Winfrey at her 23,000-square-foot Montecito, Calif. home. Alas, the photos didn't paint the full picture. "The story was that Meghan's mom had come to my house and she left laden with gifts," Winfrey explained to ET weeks later. "You know what the gifts were? First of all, she's great at yoga, so I said, 'Bring your yoga mat and your sneaks in case we just want to do yoga on the lawn.' So one of the bags was a yoga mat and the other was lunch." As it turned out, the pair's mid-day meal had included a citrus dessert Ragland had raved over. "She said, 'I love kumquats,' and I said, 'I have a kumquat tree! You want some kumquats?' So it was a basket of kumquats, people," Winfrey elaborated. "For all of the people who said I am getting her gifts and I'm trying to bribe her for an interview—they were kumquats. If kumquats can get you an interview, I'm all for it!" While the get together may not have resulted in the exclusive sit-down of everyone's dreams, Oprah did score an invite to the wedding of the year. And following a little dress anxiety that occurred when her planned cream Stella McCartney dress appeared a touch too white, "Which led to the Stella McCartney team's working all night on a rose-colored variation," she shared in the August 2018 edition of her namesake magazine, she was left stunned by the splendor of the occasion. "I was unprepared for the depth of emotion I felt stepping onto the grounds of Windsor Castle. It literally took my breath away," she gushed, revealing she skipped out on the bus option in favor of a limo from her London hotel. "I exclaimed out loud to no one in particular: 'Whoa! This right here is a whole 'nother level!' And I thought immediately of the history, the legacy, the astounding moment Meghan Markle was stepping into. And what it would take to be prepared for such a moment. The life she was leaving behind and the new world to which she was rising—all part of a destiny she helped design." And as she listened to Most Reverend Michael Curry's rousing sermon, those emotions shifted to pure, unadulterated joy. "You couldn't be in that chapel, or even watching from afar, and not feel the power of love," she concluded, adding it left her optimistic about what the newlyweds could accomplish together: "I can't wait to see the goodness that will come from their union. Goodness that I know for sure will help change the way the world thinks about what is possible, even more than it already has." Remarking on the portrait of Meghan as a difficult, diva-like duchess, Winfrey said on CBS This Morning, "I think she's being portrayed unfairly. And I feel that if people really knew her, they would know that she is not only everything that we perceive of her as being graceful and dynamic and holding that position, but she just has a wonderful, warm, giving, loving heart. I see all the crazy press around her, and I think it's really unfair." As for Harry, he's every bit as thoughtful as his press would lead you to believe. Since that fateful chat, Winfrey raved, he's been all in on their joint project. "He is a great partner and I want everybody to know that, first of all, I don't do or engage in anything unless I'm giving 100 percent. He feels the same," she asserted on The Daily Show. "And so he is a great partner in helping us decide who we're going to interview, how it's going to be interviewed, what subjects we're going to be covering." As such, the pair have gotten together for "several" clandestine meetings in London, she said on CBS This Morning as they worked out the details for their 2020 series. "I've flown there with the crew, sitting in sessions, talking about the directions we're going to take," she said. "I think it's going to make a, our hope is that it will have an impact on reducing the stigma and allowing people to know they're not alone and allowing people to speak up about it and being able to identify it for themselves and their friends." And in a world where mental afflictions are seen no differently than, say, a diabetes diagnosis you work to keep under control with the help of medical professionals, well, Harry's delighted by the prospect. "I truly believe that good mental health—mental fitness—is the key to powerful leadership, productive communities and a purpose-driven self," he stated in his Instagram post. "Our hope is that this series will be positive, enlightening and inclusive—sharing global stories of unparalleled human spirit fighting back from the darkest places, and the opportunity for us to understand ourselves and those around us better. I am incredibly proud to be working alongside Oprah on this vital series." As for Winfrey, naturally, she's charmed, chiming in with some 4,000 others to comment on the post. "Delighted to be partnering with you," she wrote. "Hope we shed a lot of light. And change some lives!"